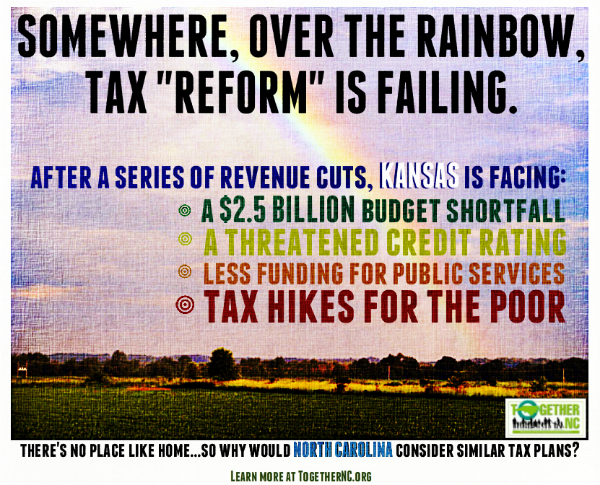 Concerns over the state’s credit rating aren’t the only thing that should give Kansans pause. By starving public schools and other services critical to economic success, the state is jeopardizing future growth. By scaling back or eliminating income taxes and moving toward a reliance on higher sales taxes for revenue, Kansas is asking hardworking middle and low-income taxpayers to carry a heavier load than their wealthy counterparts. The sales tax rate might be “flat” – meaning everyone pays it at the same rate – but the impact is not because middle and low-income families actually spend a much higher percentage of their dollars on taxable goods and services. If any of this sounds familiar, it’s because lawmakers in North Carolina and other states are considering similar plans to reduce income taxes as a way to attract both individuals and businesses. In reality, these plans and the flawed economic theories from which they stem will only serve to shift the load from the wealthy and profitable corporations onto hardworking taxpayers, while also reducing available revenue that states could otherwise invest in services and infrastructure that generate economic growth. For North Carolina, the “race to zero” might soon be on – but that phrase sure seems likely to take on a different meaning.